The Barbeque Nation in Kalyani Kalyani Nagar is now an old wine in a new bottle. Having shut its doors for months because of renovation, the place is now open with additional live counters and a slightly revamped menu. What we liked the most? Apart from their signature grilled appetiser, the starter dishes from their live counters have our heart. There are separate live counters for vegetarian and non-vegetarian food. You can now gorge on different types of chaat, tava veg, chap, & tikkis. For meat lovers, these counters serve heavenly minced-meat dishes, meat chat and minced kebab dishes. The drinks menu is usual and they have fantastic options for those who wanna sip and have a good time. 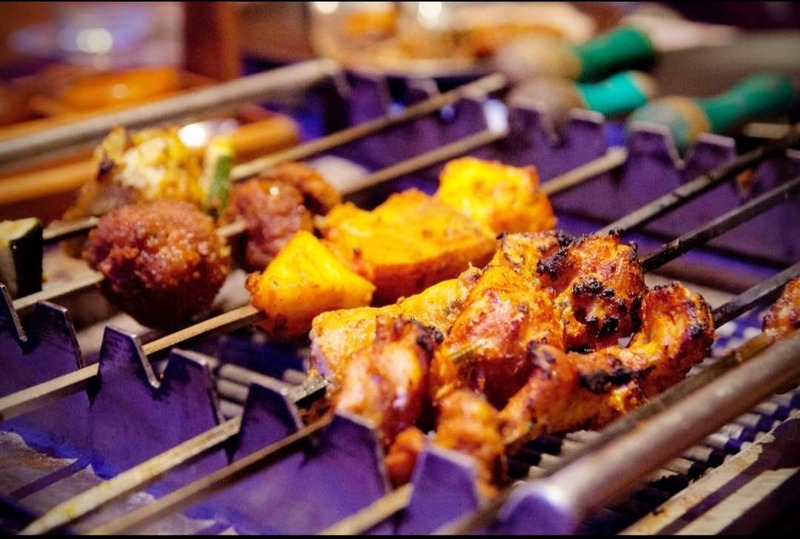 One of their biggest selling points is the assortment of barbecue skewers, available in veg and non-veg options, across cuisines such as Indian, Mediterranean, Chinese and Lebanese. We particularly love their spicy prawn barbecue along with a king-size seekh kebab platter cooked in Afghani style. Apart from live grills, we recommend you try their chicken dum biryani, bhuna gosht, kadhai paneer for the main course. They also serve delicious pumpkin soup. They should consider increasing frequency of serving sea-food in their buffets as it is available on only selective days.